There is so many amazing food and drink options available at Walt Disney World, it would be impossible to try it all. 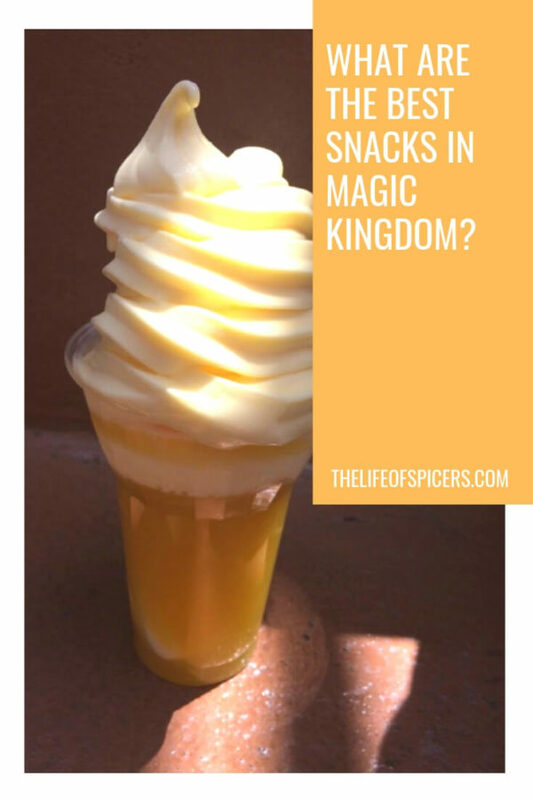 Just what are the best snacks at Magic Kingdom? I have tried a few over the last few visits and can’t wait to sample more on our next visit. Snack credits at Disney World account for a lot of our food options throughout the day as many can even substitute a meal. If you’re on the Disney Dining Plan then Disney World snack credits will be a big part of your days. You are allocated two snacks per day per person as part of the plan. If you want to get the most value for your money from the dining plan then it’s advisable not to use your snack credits for items such as coffee or bottled water. Generally as a rule of thumb any snacks that cost over $5 on the menu is something that will maximise value. As your holiday goes on however you will probably find that you have lots of snack credits left over that need using up. This is when we start to use them for bottled water, bags of sweets and popcorn. Not all snacks mentioned in this post are dining plan snacks, however a lot of them are. Some are so big that they are a cheap alternative to a meal if you’re paying out-of-pocket. We’ll start in Main Street as we enter Magic Kingdom. There are so many places to stop and buy snacks from the Main Street bakery where you can find cakes, cookies and sweet treats galore. The Main Street Bakery is also disguised as the Starbucks location and for a snack credit you can enjoy the largest Grande coffees and teas. 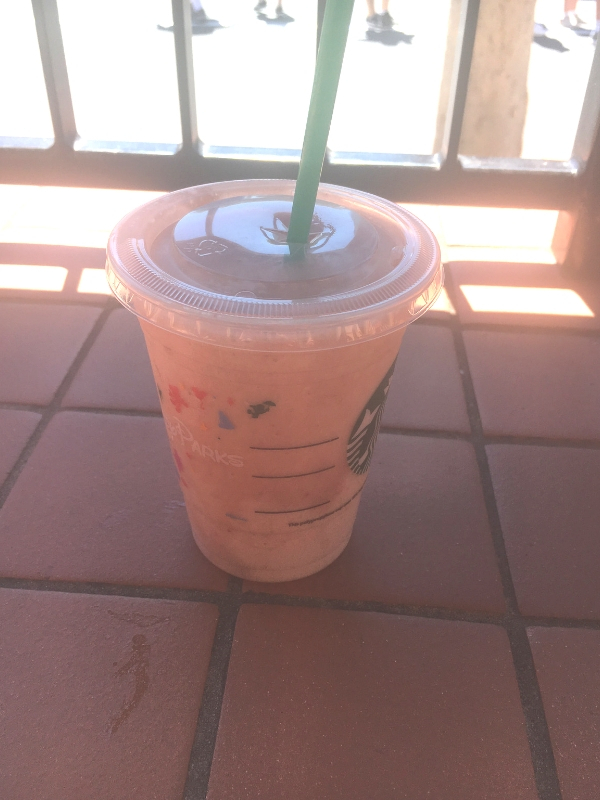 We found Starbucks offer a strawberry banana smoothie which is really refreshing in the Florida heat. This was one of my go to drinks on our last visit. Also on Main Street is the Plaza Ice Cream Parlour where you can find amazing flavours of ice creams to tempt your taste buds. Perhaps an ice cream sandwich will tempt you. If you’re looking for a sweet treat then you can’t walk past the Main Street Confectionary. It’s a great place to watch the cast members creating the sweet treats. I dare you to walk out without purchasing something. As we go around into Liberty Square, it’s here you can get some amazing snack items which I think could also act as a meal. Liberty Square market is a great place ti stop off for a quick drink and snack. At Sleepy Hollow refreshments you can get funnel cakes that look big enough for two to share. A funnel cake was on my list for our last visit but we were never hungry enough to try one. It’s back on the list for next time. Perhaps you’re looking for a bowl of chilli or some French fries from Columbia Harbour House. Over in Adventureland is the home to Aloha Isle. 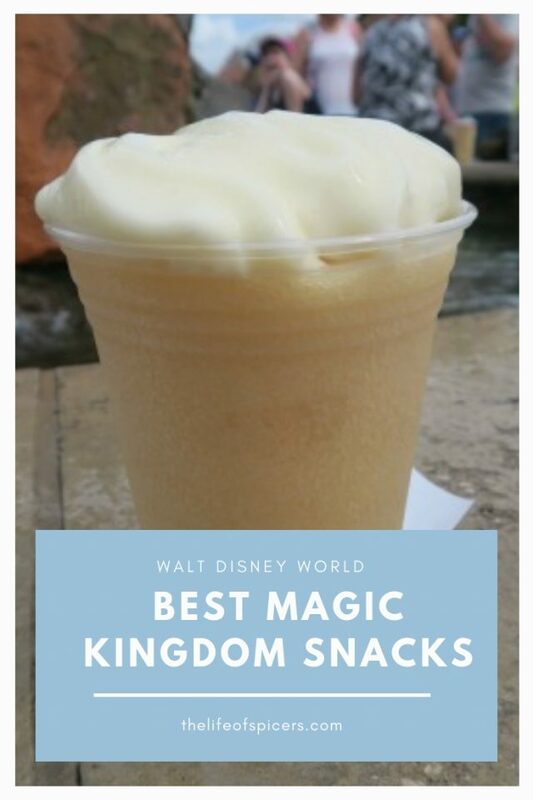 If you go nowhere else in Magic Kingdom then you have to go here to get one of the best snacks in Magic Kingdom, a pineapple Dole whip float. 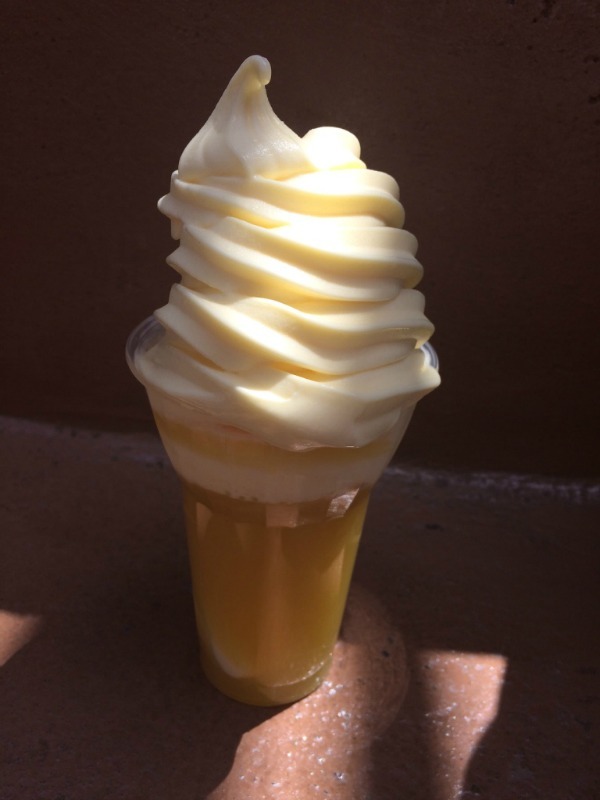 A mix of dole whip soft serve ice cream and pineapple juice, this is one of the best snacks at Magic Kingdom on the Disney dining plan I have ever tasted. If that doesn’t tempt you then perhaps try a citrus swirl ice cream. I’ve heard very good things about the snack cart in Adventureland selling cheeseburger spring rolls. Will you be lucky enough to find one? Next door in Frontierland, you can get a variety of sweet and savoury snacks to tempt you. You may want to try some churros or tortilla chips from Pecos Bills. Fantasyland is a place we love to go for breakfast. Inside Gaston’s Tavern you can get a cinnamon bun big enough for two. We found a new love for cinnamon buns on our last trip and they did a good job of fill-in us up first thing in the morning. 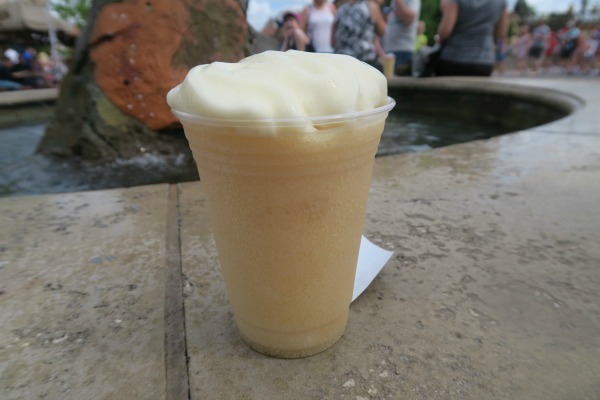 Also in Gaston’s Tavern, you can get a Le Fou’s Brew which is a mix of frozen apple juice and spicy marshmallow. It’s so refreshing we really enjoyed them. Mind the brain freeze though! Offerings from Pinnochio’s Village Haus include a side Caesar salad and some fries if you’re looking for something to eat but don’t want a full meal. Into Tomorrowland you can stop by Auntie Gravity’s Galactic Goodies to pick up an ice cream sundae, or perhaps pick up one of the best savory snacks at Magic Kingdom in my opinion, a Mickey pretzel from The Lunching Pad. Aside from the main locations mentioned in this post, there are also stand alone carts and smaller kiosks dotted around the Magic Kingdom park. They all sell a variety of snacks including ice creams, bottled drinks, pretzels, popcorn, sweet treats and so much more. 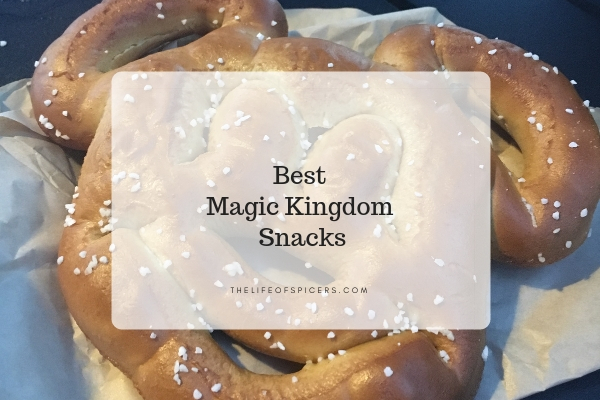 We often take great advantage when in Magic Kingdom and use some of the snacks listed above to use as a stop-gap if we have a larger meal planned for later in the day. Often in the heat you will find you don’t always want a full meal so a snack is a great idea. 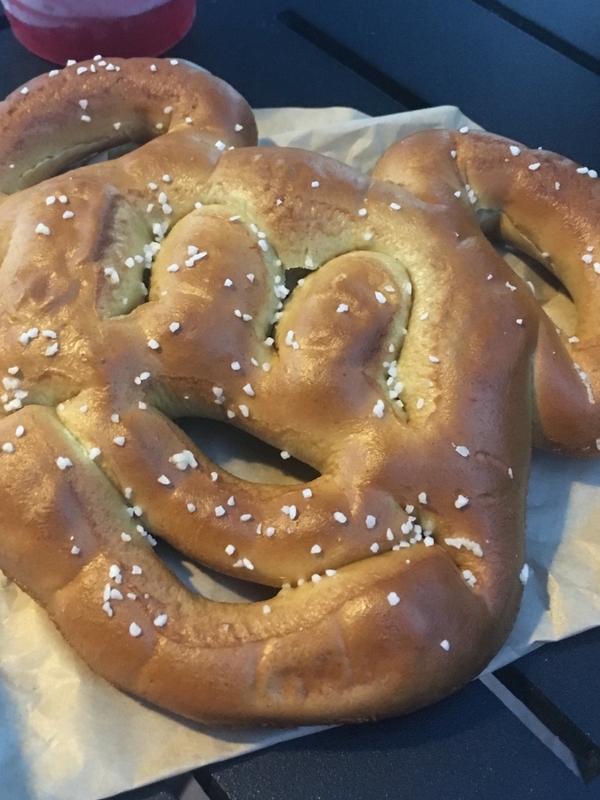 What are the best Magic Kingdom snacks you’ve ever tried?